I’ve been getting worried about my ‘aging’ skin recently. It seems like every time I look in the mirror my face has gotten a little looser and at this rate it won’t belong before my jowls are touching my collar bones. Innoxa is a brand I discovered when I was searching for cruelty-free deodorants and anti-antiperspirants (I’ve found a truly fantastic product – review coming soon!) and is accredited by Choose Cruelty Free. They are 100% cruelty free, but do advise that some of their products contain animal derivatives so provide a list of Innoxa vegan friendly products. There are six Innoxa skin care ranges – Anti-Aging, Firm & Lift, Oily/Combination, Sensitive, Dry to Normal and Skin Brightening. I ‘ummed’ and ‘ahhhed’ for a while over whether I should try the Anti-Aging or the Firm Lift products, however the decision was made for me when I got to the store and they only had the moisturiser from the Firm and Lift range. 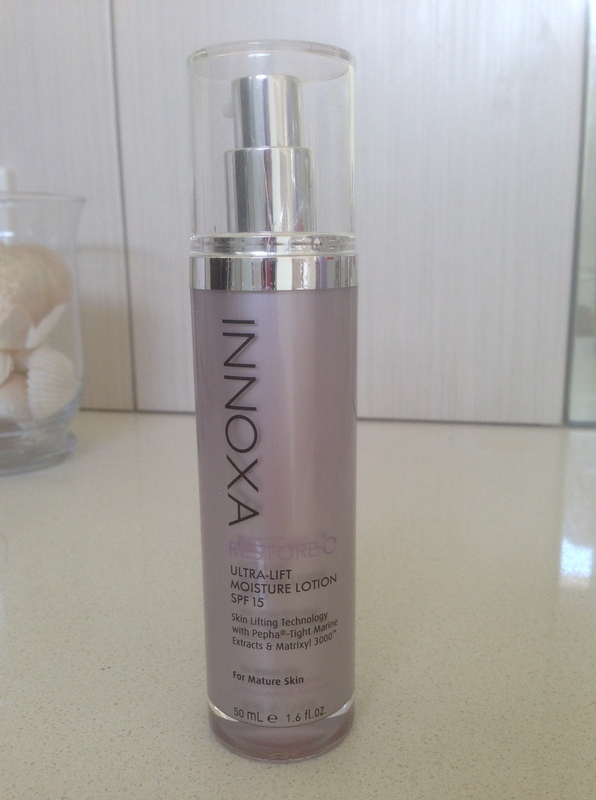 Innoxa Restore Ultra-Life Moisture Lotion SPF 15 comes in a 50ml pump pack and costs just AU$29.95. It applies beautifully – I would say it actually glides on, and initially I was worried it was just slipping over my skin, but it absorbs easily leaving my face feeling moisturised, but not at all greasy. A little of this product goes a long way. It contains SPF 15 – perfect for dealing with the incidental sun exposure we experience every day (especially living in Australia) and I never remember to apply sun screen on my face every day (I also generally hate the greasy feel they leave behind). As it contains sunscreen however I ONLY use it for day time. I prefer not to put chemicals on my face (i.e. sunscreen) that I don’t need at night. The pump dispenses only a small amount at a time – so I never end up with too much as is often the case with a lot of pump packs. The price! At only $29.95 for 50ml I am not worried about economising so can happily use it on both my face and all over my neck – an area that often gets left out with more expensive lotions. The Innoxa range contains skin care, cosmetics, toiletries and fragrance, and is available in Australia online, and in Myer, Priceline and selected pharmacies.